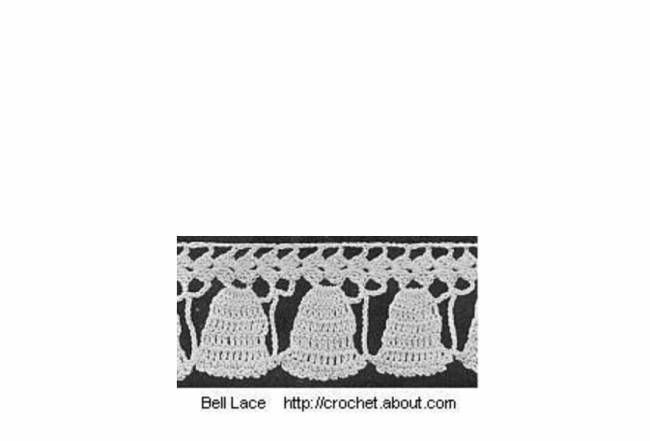 This is a free crochet pattern for a lace edging that can be added to the bottoms of towels, the sides of pillowcases, the edges of linens and other projects. Add it to hand crocheted items or to sewn items that you have purchased at the store. This is a vintage crochet edging pattern that was originally printed in the year 1916 in the book Novelty Crochet Patterns, Book No. 7, published by Novelty Art Studios. This pattern was updated and republished in 2002 by Sandi Marshall. This is her version of the pattern. You can use the crochet thread size of your choice with the corresponding size steel crochet hook. The example shown here was made with size 10 thread and a size 8 steel crochet hook. It is shown in white, which is perfect for wedding bells. You could also crochet this in red/ green thread for a Christmas design. It is very important in this crochet pattern that you only turn the work when the pattern tells you to do so. In most crochet patterns, it is assumed that you turn the work at the end of each row (unless you are working in the round). However, in this pattern, you are sometimes working to the left, rather than the right, and this is accomplished by turning the work only when specified. Pay close attention to this detail as you work. It is also helpful to know that the shells of this pattern run along the top of the bells but you are crocheting one bell at a time. So, you will begin by crocheting the shells above the first bell and then making the bell itself. At the end of that, you will work back along the side of the bell to get back to the top of it where you will crochet the next set of shells and the next bell. Keep this in mind as you work if you get at all lost in the pattern. Row 1: 2 dc in 4th ch from hook, ch 2, 3 dc in the same place as the last dc's were worked, ch 6, turn. Row 2: 3 dc in ch-2 space, ch 2, 3 dc in same ch-2 space (shell made). Row 3: ch 5, turn, shell (see directions above). Row 4: ch 2, 1 dc in 3rd ch of ch-6 (this ch-6 is between the first shell made and the second shell made), ch 6, turn. Row 5: Shell in next ch-2 sp (in center of last shell made). Row 6: *ch 5, 9 dc in ch-5 sp (that's to the left), turn. Row 7: ch 3 (counts as first dc), 1 dc in each of next 8 dc (9 dc). Turn. Row 8: ch 3 (counts as first dc), dc in same stitch as ch-3 just made, 1 dc in each of next 8 dc (10 dc), turn. Row 9: ch 3 (counts as first dc), 1 dc in each dc (10 dc), turn. Row 10: ch 3, dc in first dc, 1 dc in each of next 9 dc (11 dc). Row 11: ch 3, sc between the first and second dc; ** ch 3, sc between the next two dc, repeat from ** 8 more times. Row 12: ch 12, sc in ch-5 sp at top of bell. Row 13: ch 5, shell (in center of last shell made). Row 14: dc in third ch of ch-5 (the ch-5 is to the left, at top of edging), turn. Row 15: ch 6, shell, turn. Row 16: ch 5, shell, turn. Row 17: ch 2, 1 dc in third ch of ch-5, turn. Additional Important Note: After making 11 dc of second bell, ch 1, slip stitch to first ch of ch-12; repeat as over first bell.